This authoritative continuing education course identifies the advantages of kettlebell training and offers program design concepts to meet specific training and athletic goals. Identify the advantages of kettlebell training over other forms of resistance training. Understand a variety of kettlebell exercises for specific body segments. Design a kettlebell training program that meets specific training and athletic goals. Identify the key variables in developing kettlebell training programs. Understand the concept of periodization and its use in designing kettlebell training programs. 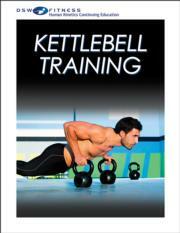 Incorporate kettlebell training exercises into existing training programs. Outline kettlebell training recommendations for specific sports and activities.